Hostel is simple but excellent. Clean and tidy. Good breakfast and excellent wi-fi. Staff is always available to help you and will also offer a lift from/to the bus station if needed. They are also very helpful with whatever issue you need help with. 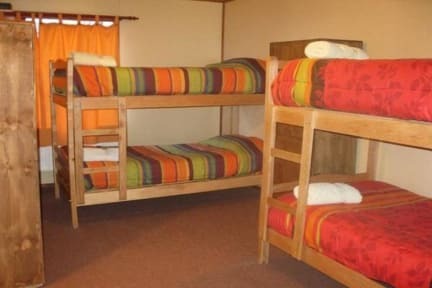 The hostel is well located for most of the services you might need. In any case, the furthest you might have to go is the bus station and that is no more than 20 minutes walking (if needed). Great hostel, rooms and common spaces were warm, comfortable and clean. Would not recommend renting their gear, but they were very helpful in finding us alternatives. Free rides to and from the bus terminal were very helpful. Breakfast was an egg, cornflakes, yogurt and bread. Good wifi! The hostel manager was lovely and went above and beyond to help us out when someone crashed into our hire car! The kitchen was well equipped, and the room was comfortable. Only negative we could say was we were there for 4nights and our room didn’t get cleaned. Due to unfortunate circumstances mentioned above we did have to spend more time in the hostel and our room than planned, so maybe this is why. 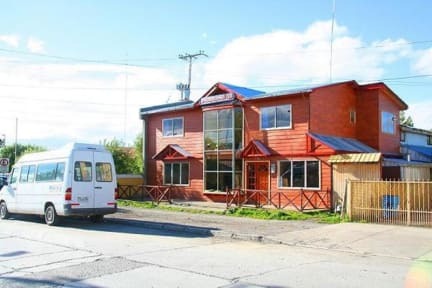 We booked at the beginning for 2 nights and at the end we extended our stay in total to 5 nights while visiting Torres del Paine and a short trip to El Calafate. Initially we booked a double room with a shared bathroom but got an en-suite twin room due to availability without any additional cost. The staff was exceptionally great. They helped us booking a car for our tour to Torres del Paine. The breakfast was good and the kitchen in general ok. We would definitely recommend this place! Beautiful place and the kindest most helpful staff. Rooms were nice and clean, WiFi was very fast, lovely relaxing place to stay in a great location to the main streets. Great hostel, friendly and helpful staff, warm rooms and hot showers. Includes a great breakfast with freshly squeezed juice and eggs! They even collected us from the bus station for free! Very central location. Would stay again! The staff were generally amazing (only one time a staff member wouldn't let us get hot water from the kitchen while he was preparing the breakfast). The hostel does free bus terminal transfers and let's you store your luggage while away. Best thing was the breakfast - homemade jams, homemade blended juice, an egg, homemade slices and yummy bread!! They also have yoghurt and cereal. Very close to the water as well as the main Street and supermarket and banks. Would highly recommend. Great place to organise yourself for Torres del Paine. They hire our backpacks and cooking utensils/kits and know lots about what’s going on. Kitchen was basic but useful. Rooms were comfy, good bed, good showers, can control your own heater and open the windows which is always nice. Staff speak good English and are always around to give advice. The best breakfast fruit juice in all of Patagonia! It was delicious. Great hostel - plenty of space for relaxing, chatting, chilling, sorting... Wifi worked well! Friendly staff who cannot do enough for everyone. The walls are thin and sound carries - phones on floor vibrate through into other rooms - appears pretty consistent throughout Chile. But - highly recommend and would stay again. Thanks for your hospitality. Very nice hostel 5 minutes walk from the centre of town. Breakfast was very good and included. Staff very friendly and helpful, and offered to drop us off at the bus station in the morning.